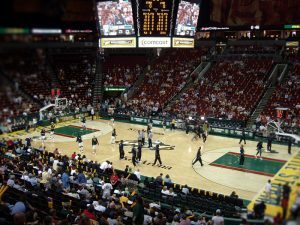 In Seattle, there’s a distinctive fan community that enjoys following the local teams – Seahawks, Mariners, Sounders or Storm. Many of us get very excited about attending these professional sporting events. We thrive in the arena because we can be social and inclusive with our friends, and we try to make the experience as memorable as possible. Who doesn’t enjoy seeing fans dancing and trying to get on the big screen, or jumping up and down when the score is close? But imagine you had financial and transportation barriers that prevented you from having this thrilling, group experience – and that you were dealing with mental health symptoms and issues, too. Many of our SAJD Supported Living clients are in this situation with these very challenges. They can have difficulty finding the means, confidence and self-esteem to be part of the fan community. As the Community Engagement Specialist in the SAJD Supported Living Program (SAJD SLP), a primary focus of my work is to increase community integration and reduce client isolation by developing and coordinating individualized and group activities. I collaborate with colleagues and clients to find solutions. Our case managers provide ongoing, direct service for the adults we serve. They take a big picture look at what’s working well and what can be improved, and they coordinate the efforts of the larger team to customize and adapt offerings to meet individual needs. When the big night arrived, each of the four clients attending was picked up by staff in the SAJD SLP van, thus eliminating the transportation barrier. All the clients knew each other but hadn’t participated in a group outing together before. They began socializing during the commute to Key Arena. Some clients reminisced about the last time they saw a live Storm game, and one client even remembered the first game he attended and shared that story with the group. A win for the home team – and for some of the home team’s biggest fans. Shaida is the Community Engagement Specialist. She received her Doctorate in Occupational Therapy in 2012 with specialties in neurorehabilitation and mental health. She has enjoyed working and volunteering for nonprofits in the Greater Seattle area for nearly five years and is currently a Board Member for NAMI Seattle.